16 oz stoneware mug for the pet lover. Straight to the heart, you wonder, who rescued who? 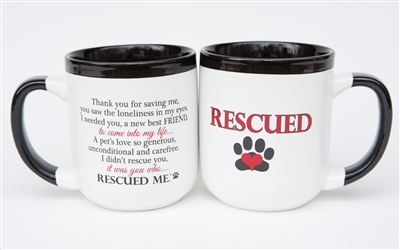 This sturdy mug is a perfect gift for any occasion for the pet loving friend or family member. Soon to be a favorite mug to hold that morning coffee or tea and celebrate the joys of being a RESCUE. You will also love our new Rescued photo sentiment frames, for one or for a family of rescued pets. See items 6106 and 6107.